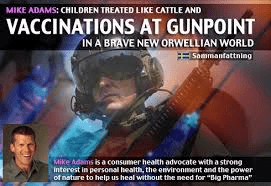 As more and more parents are becoming informed about the dangers of vaccinations and their link to autism, state health authorities are increasingly turning to “Gunpoint Medicine” to force the People to submit to the poisons of conventional medicine. Parents who attempt to save their children from deadly chemotherapy chemicals are being arrested and having their children kidnapped by Child Protective Services (see http://www.NaturalNews.com/Abraham_Cherrix.ht… ), and oncologists who used to be armed only with radiation machines and chemotherapy injectors and now arming themselves with U.S. Marshals and other local law enforcement authorities who are using loaded firearms to enforce “the will of the State” against parents who resist. Read the rest of the press release at: http://www.aapsonline.org/press/nr-11-16-07…. The end game of all this is to apply Gunpoint Medicine tactics to everyone: Adults and senior citizens included. Anyone suffering from high cholesterol, for example, who does not submit to Big Pharma’s statin drugs could be arrested, strapped to a table and medicated against their will. People with cancer could be arrested for choosing to treat that cancer with safe and effective botanical medicines instead of patented, high-profit Big Pharma drugs. If you think the prisons are full enough right now from all the arrests for marijuana possession and other victimless crimes, just wait until the State starts arresting all the natural health moms and dads across the country who refuse to participate in the utterly insane and extremely harmful system of medicine that now dominates U.S. health care today. The State is very clear about medicine: If you want to remain a free citizen, you must submit to the synthetic drugs made by the very same corporations that now control government health regulators. Any person who resists such “treatments” will be branded a threat to public health — a designation just beneath “terrorist” in the eyes of many government bureaucrats. As such, they believe there is no limit to the level of force they may use to coerce such people into submitting to Big Pharma’s chemicals. Today, it’s armed guards with attack dogs. Tomorrow, it might be water boarding or other torture methods. Think that’s impossible? Think again: Just five years ago, nobody in their right mind would have thought that parents who did not want to get their children vaccinated would end up in prison, their children kidnapped by state authorities and forced to subject themselves to dangerous chemical injections at gunpoint. Yet that is precisely what is happening right now in the state of Maryland. It happened on Saturday, in fact. What’s most interesting about this issue of using the threat of imprisonment to force vaccinations upon children is not necessarily who is speaking out against it, but who has chosen to remain silent. The American Medical Association, for example, has said nothing in opposition to the policy. Neither has the Food and Drug Administration. Where is the outrage from the Maryland Hospital Association? None of these organizations seem to have a problem with Gunpoint Medicine. The idea of rounding up parents and coercing their children into receiving injections of toxic chemicals does not seem to bother these organizations. And why should it? All of these organizations are closely tied to Big Pharma. They’re all in favor of vaccinations for all, it seems, and I have no doubt that some individuals in these organizations (especially the AMA) are strongly in favor of the Gunpoint Medicine coerced vaccination policy being played out in Maryland right now. Organized medicine believes the People are too stupid to be allowed to make their own health decisions. Bureaucrats and physicians should be the ones making these decisions, we’re told, and any person who disagrees with such decisions should be labeled a criminal, arrested and prosecuted. This is no exaggeration. It is, in fact, a shockingly accurate description of Maryland’s current vaccination policy. It wasn’t too long ago that Americans would have stood up and rallied against this kind of medical tyranny. The major news networks would have denounced Maryland’s vaccination policy with strong language and harsh accusations. People would have been marching in the streets, demanding their health freedom. But today, it’s a different America. The People are drugged up on pharmaceuticals and dosed on fluoride. They’re too intoxicated to think straight, and they’re frightened into submission by a fear-based government that invokes domestic tyranny at every opportunity to control and manipulate the People into doing whatever it wants. The “free” America we all once knew is long gone, and it has been replaced with The United States of Corporate America, where police tactics are now used to enforce hazardous public health policies, and the people who run the State no longer think there’s anything wrong with rounding up the population at gunpoint and performing large-scale medical experiments on their children. That’s what modern vaccines are, after all: A grand medical experiment whose effects will only become known after a generation of mass poisoning has come and gone. This entry was posted in E Patient Health Care, Emergency Medicine, Human Behavior, Introducing, Lifestyle Health, Medical Studies, Tele-Medicine and tagged and Attack Dogs, as Armed Police, Children Herded Like Cattle, desperation of organized medicine, E Patient Healrth Care, for Forced Vaccinations, Gunpoint Medicine, illegally conspired to threaten parents, Into Maryland Courthouse, Maryland, Stand Guard, under orders from the State Attorney General, Where is the outrage? by Admin. Bookmark the permalink.